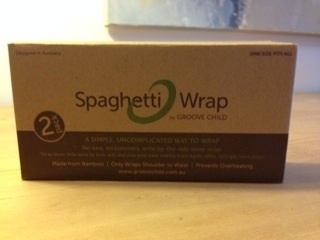 Created by Groove Child, the Spaghetti Wrap is a swaddling product for babies up to 6 months of age, and was given to me as a gift when I had my second little boy. I'd not heard of it with our first child, and we'd used a myriad of swaddling products with him, many of which he simply found his way out of. Keen to give swaddling another go with our second boy, I was eager to try out this new type of wrap. The Spaghetti Wrap is a silky smooth tapered fabric wrap that is designed to promote arms by side swaddling for the baby. There are no catches, zips, velcro or buttons, you just wrap around your baby's torso and tuck in when you have it secured as you wish. For me, this simplicity is a winner from the get go as when you are a sleep deprived parent, easy is good. The design of the wrap means that only the arms and torso area is swaddled, so legs are free to move around. This provides a hip healthy sleeping environment for the baby that can assist with the prevention of developmental hip dysplasia. For our little boy, who suffered terribly with trapped wind, having his legs free meant he was able to kick his legs about in order to expel excess air. When we first swaddled him in a sheet with his legs tucked away, he would squirm and grunt away, but this didn't happen with the Spaghetti Wrap. As only the torso area is wrapped, there is no need for any unfastening during the night for nappy changes or feeds. You can simply leave the baby in the swaddle, and still have access to the nappy. If you're particularly stealth, you can even do a nappy change without waking up your baby. Aside from what I have already covered, the Spaghetti Wrap is a swaddle product designed to help a baby stay sleeping for longer by providing a fuss free solution to parents. It swaddles tightly round the torso and even my wriggly baby couldn't get out of it, so this meant less wake ups to settle him from the startle reflex. Having access to the nappy area also meant that night time changes were relatively easy and settled. This access to the leg area also means that you can transport the baby from the cot to the pram with very little disturbance as you can use in the standard car set/pram safety harnesses. A big plus point for Aussie babies, is that this wrap can be worn by a baby with just their nappy, so this really minimises the risk of overheating. Our first baby was a Summer baby and despite him being comforted by swaddling generally, I worried so much about him getting too hot in a swaddle. With the Spaghetti Wrap, the fabric is so light that this is not an issue at all. For cooler climates, or for Winter babies, just team with a snuggly sleep suit. You can even use it with a sleeping bag. If you're buying as a gift for others, the packaging is really beautiful and as soon as a new or expectant parent opens up the wrap they'll be delighted with the feel of the fabric. It's a gorgeous bamboo infused wrap that feels really soft on your skin, so you know that it will be great for your baby. Washing the wrap is simple, and I've just included in our standard load and been delighted that it dries super fast which is great for when a baby has been sick in the night. Difficult to think of any really. If I had to think of any, I would say the only negative is that this is a sleep solution for those under 6 months, and so when the Spaghetti Wrap has worked so well to assist sound sleeping, it feels a shame to give it up at this stage. However, swaddling guidelines advocate transitioning away from this technique at 6 months anyway, and our little guy certainly had no issues moving into a sleep sack at this time.